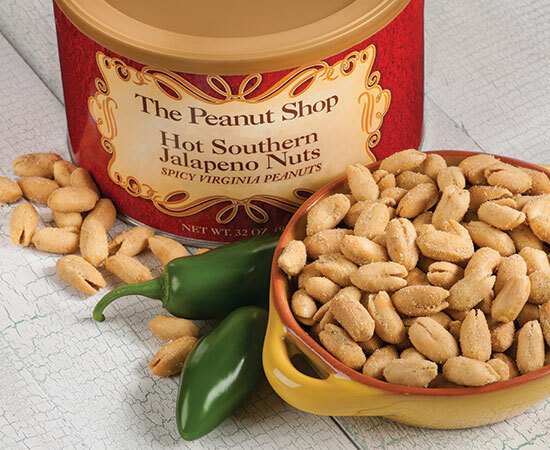 Handcooked Virginia Peanuts..temptingly seasoned with Jalapeno, onion, and garlic, these are a spice lovers dream. Always one of our most popular items, we know these hot nuts will be a hit at your house. Got a tin of these peanuts as a Christmas gift and these are absolutely delicious! Like another review said, these peanuts will put a nice "warmth" in your mouth but the heat is not too strong that I believe any peanut lover will enjoy. So much that you can't just stop at one handful. Bought the peanuts for my husband on a whim...we both loved them and so did our friends! Not overly hot/spicy...perfect! These peanust have a a wonderfully "zippy" flavor that makes fireworks happen in your mouth. You will not be able to just eat one handful.